A traditional image of a Christmas tree, with each member of the family reflected in the baubles. 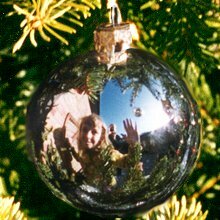 To get this we had to take separate photographs of each person in a different bauble on the tree, and then produce a composite image. Alice is reflected in the silver bauble. Behind her you can just see the photographer himself in the sunlight. And the blue sky and outside brick wall - the photo shoot entailed setting up the tree in Grandma Edna's garden in Rathmore Road, where we could get high angle natural sunlight.